It’s been quite a ride here at Coh&Co since you last heard from us. 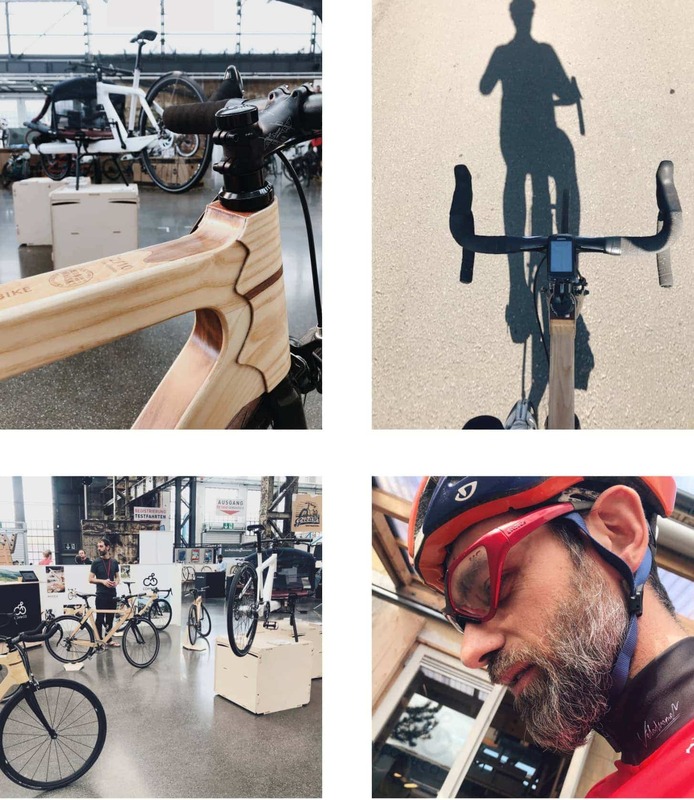 Back home after a few weeks on the road in Germany visiting Berliner Fahrradschauand Cyclingworld Düsseldorf, we feel exited and overwhelmed by the appreciation and interest received from the cycling community on both our WOOCA bikes and the latest addition to the family, the VeloSled. A huge thanks to all of you who showed up for the pre-launch in our workshop and later at the bike shows! Your support is greatly appreciated. 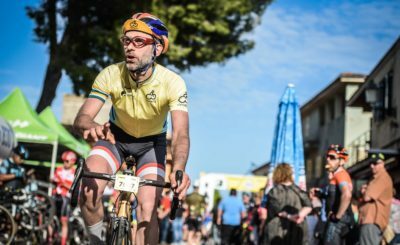 Our very own “Gallego” decided to start off the cycling season riding his Gustav Racer the 734 kms to the show in Düsseldorf. 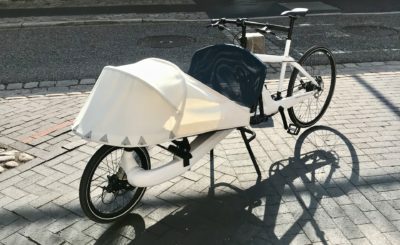 As some of you may be aware we have spent much of the past two years working on developing the VeloSled, a two wheeled, carbonfiber cargo bike made to move families and goods. Our first model has been dubbed Anna and is hitting the streets this year. We have now completed frame number one and she is an inspiration to us all. As is to be expected there are a list of small changes to be made before she goes into series production later this spring, but she is a proud beauty and stands strong on her own as she is. VeloSleds are based on a modular3 mold carbon construction. Each component is monocoque laminated under positive pressure in female tooling. Our choice of carbon composite construction ensures more than lightness. Carbon allows us to “over engineer” the frame to insure the rugged and long lasting toughness we are looking for. Anna is designed to surf the urban streets be it as a family sled or a work platform. Anna has a stifness and strength unmatched. Carbon means that her primary structure is completely free of any corrosion issues and should there be any issues with the hardware, all metal parts are replaceable so that they can be maintained and serviced over the years as needed. 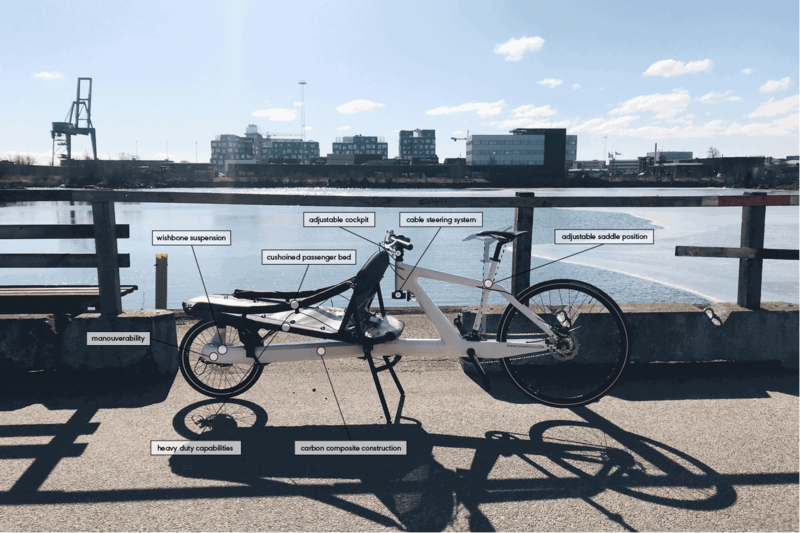 In addition to their structure VeloSleds sport a list of innovations previously unseen in the cargo bike world. Wishbone suspension in the front. This allows us to tune and modify the steering atributes of a frame to meet the likes and needs of the owner. Wishbone suspension also allows us to provide a smooth ride. Cable steering as used in almost all offshore racing yachts is provided with a redundant cable system. Thus we ensure safety should their be an unexpected cable failure. 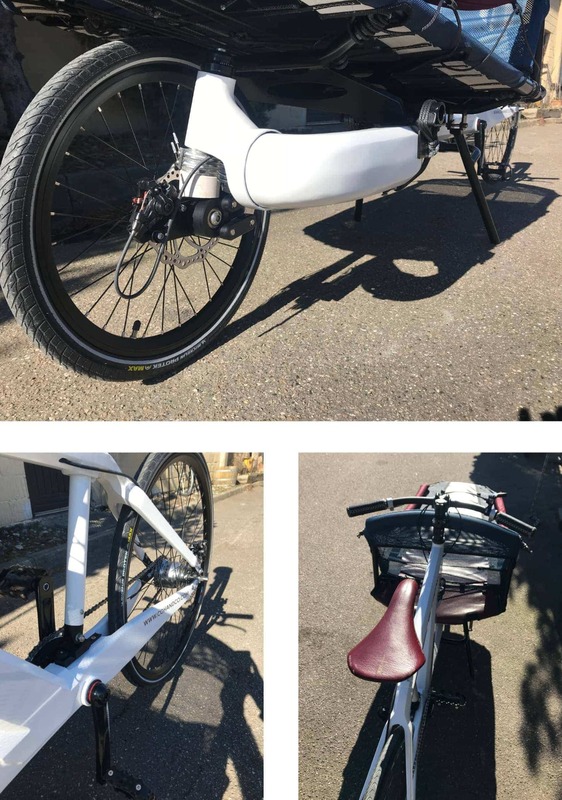 Cable steering is not new to the cargo bike market but when combined with our wishbone suspensdion it provides an unmatched responsiveness and feel. Manoeuvrability. A VeloSled has a turning radius less than its own length! One size really fits almost all! Our adjustable cockpit doesn’t just allow us to raise and lower the handle bar as is often seen. Our adjustable seat tube placement allows for around 180mm of horizontal placement. This means that the cockpit can be adjusted like the drivers seat in any car fitting anyone between 1,5 meters and 2 meters with only a moments adjustment of the saddle placement and stem height. 1,2 meter of comfort! Passengers young and old are now able to feel safe and comfortable in a cushoined passenger bed that is inspiered by the dog sleds of the Inuit which have worked so well for family transport on the tundra and inland ice of Greenland. As one can see from the above we have been busy with the development of Anna, but we have also been working on developing production capacity for our beloved WOOCA frames. After two years of production rationalisation and process development we are finally building up frame stock. This is intended to make our production schedule more dependable and predictable. We currently have a stock list and a production calendar and are also in the midst of completing the first of a new model of frames we look forward to presenting next month. 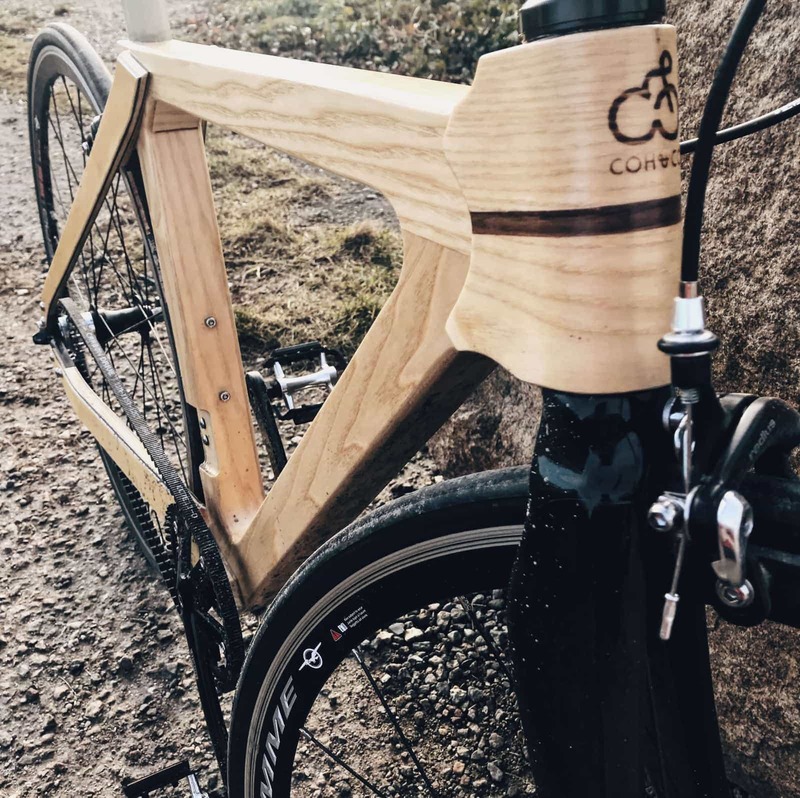 We are still convinced that WOOCA provides the stiffest and smoothest ride available in any frame technology anywhere. That is to say we are not the lightest but we provide more power transfer per gram than any other build technology – and this without delivering the harsh ride experienced with other bikes optimised for stiffness and power transfer. Get the full tech talk in this post by Paul. We have now begun offering a single speed urban model fitted with a Gates Carbon Drive and this makes for the sexiest of sporty hot rods. This combo is a low drag, reponsive bundle of joy! We believe that our WOOCA frames need to be trialed to be understood and we encourage anyone interested to get in touch with us or our small but growing association of ambassador shops to give WOOCA a spin!